DC Comics character 'Zatanna' will appear in upcoming episodes of the Vancouver-lensed CW TV series "Smallville", played by actress Serinda Swan. 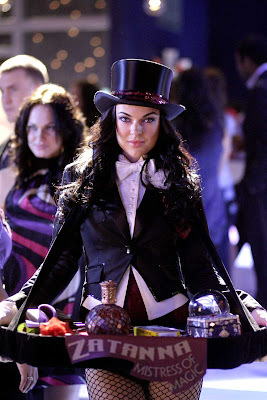 In the episode "Hex", airing Thursday, March 26, female magician 'Zatanna' (Serinda Swan) shows up at the birthday party of 'Chloe' (Allison Mack), granting Chloe's wish to be more like 'Lois' (Erica Durance), switching the two into each other's bodies. While Zatanna searches for her father's book of spells to conjure up his spirit, she also grants 'Clark' (Tom Welling) his deepest wish." "Hex" was written by Bryan Q. Miller and directed by Mairzee Almas. Created by writer Gardner Fox and artist Murphy Anderson, Zatanna first appeared in DC's "Hawkman" #4 (October-November 1964). The character is the daughter of magician 'Giovanni Zatara' and mystic 'Sindella', a member of the 'Homo Magi' race of beings and direct descendant of alchemist 'Nicholas Flamel'.